RIO DE JANEIRO (AP) Kei Nishikori and the Rio Open will be upstaged this week. He’s the top-seeded player, but not the best show in town. That’s because it’s Carnival week in Rio de Janeiro, where tennis will play second-fiddle to the sensuous samba rhythms, street revelers, and the famous all-night parades at the Sambadrome. ”If I win, yes, maybe I’ll go,” Nishikori said on Monday, admitting he didn’t realize it was that special week in Rio. ”Yes, he should come by,” Kei Kuwabara told the Associcated Press. Kuwabara said he was a member of a samba school in Yokohama, and planned to march with the Magueira School, one of Rio’s most popular samba groups. ”There are a lot of Japanese who love samba and practice samba all year round to prepare for samba carnivals like here,” Kuwabara said. 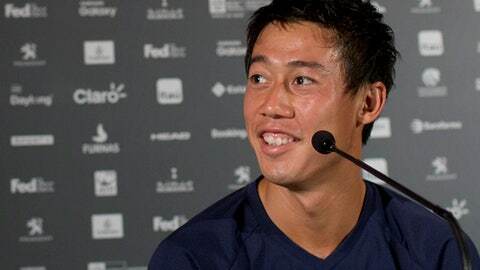 Many Japanese have ties, but Nishikori doesn’t appear to be one. Nishikori, who is No. 5 in the world rankings, could be out of the tournament early if he’s not careful. He faces local Thomaz Bellucci in the first round. Nishikori defeated Bellucci two years ago at the French Open in three tight sets. Nishikori won the Memphis Open for four straight years, but decided to abandon the indoor hard-court tournament this season to play in Rio. He’s won two of his 11 singles titles on clay, but it’s not his favorite. ”Maybe I still like hard-court a little better, but I’m feeling very comfortable playing on clay now,” he said. This is Nishikori’s first trip to Rio since he won an Olympic bronze medal here six months ago.